There are several types of wasps throughout Missouri, and each has its own nesting type and location.Paper wasps get their name from the paper-like material they use to construct their nests. Inseminated queens begin building nests in the spring, which they create on walls, eaves, and other visually accessible areas, such as attic rafters or deck floor joists. Nests range from small to moderate in size, containing from 150 to 250 cells by autumn. Adult paper wasps measure ¾ to 1 inch in length and are a combination of brown, yellow, orange and/or black, depending on the species. They are typically not aggressive. However, they are very protective of their nests and will sting those who get too close. As the name suggests, Cicada killer wasps get their name because they hunt cicadas, which become a food source for their developing larvae. Although formidable in size, potentially exceeding 1 ½ inches in length, they reserve their sting for cicadas, unless provoked. However, Cicada killer wasps create their nests underground, in open areas such as lawns, making it easy to step on them and get stung. 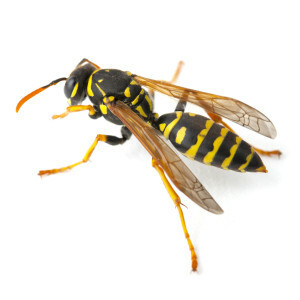 Wasp treatments depend heavily on the type of wasp, and liquid treatments are used typically. For paper wasps, our application kills the bees instantly, allowing an immediate resolution to your problem. It also usually enables us to include nest removal in our service. With Cicada killer wasps however, a liquid treatment is used on the ground in the area of their nest, and takes time to have an effect. So, a follow up treatment may be necessary.